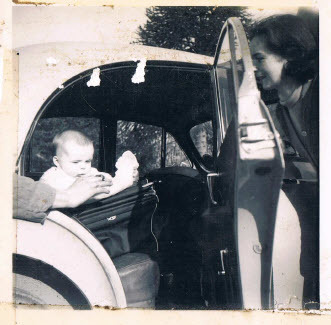 Morris Minor, and that's my Mum to the right). It's day 30 of the Jeff Goins 500 Word Challenge and today's task is to write about "childhood", "innocence", "ignorance", "dreams and hopes". I was born in the 50s (just about - October 1959) and grew up in the 1960s. This was the decade of flower power and free love - but all this had passed me by before I realised what it was. Hippies were mystical creatures that existed in far off places like Dublin and America. I didn't grow my own hair until about 1972 - the 1960s was strictly short back and sides style hair cuts in Harry Ringwood's barbers in Enniscorthy. The whole decade seemed to pass by very quickly, and the older I get the less memories of it I retain. It was a decade of school, religion, and playing. My favourite TV programmes were The Monkees, Robin Hood, and The High Chaperral. When I was very young I loved Wanderly Wagon and Jimmy O'Dea telling stories. Cartoons like "The Pink Panther" and "Tom & Jerry" were very popular in our house. The one thing thing that bugged me was that we only had RTÉ television in our house - every one else seemed to have BBC and HTV (ITV Wales) as well, but we lived in single channel land on the wrong side of a hill and could not pick up a strong enough signal from Wales. I was so jealous of the boys in school talking about what they had seen on Blue Peter and (later) Match of the Day. Little did I know that 50 years later I would not be able to count the number of TV stations I have in my own house. My best friend in school was Barry Brennan - we were inseparable. He came to our house to play, and I went to his. He lived in Carnew so he was a "townie", so exotic places like Byrnes sweetshop were just down the road for him. I was so jealous. His back yard was Wembley, Croke Park, and Landsdowne Road to us - we were Georgie Best, Mick O'Connell, and Mike Gibson. Innocent times indeed. I have not met Barry (I'm guessing) since the 1980s. We hooked up last year online via Linkedin, and promised each other to meet - maybe some day we will. Above all the 1960s was a decade with my Mum - she brought us everywhere. As we were small she had to bring us everywhere she went. She was from Gorey, so we were familiar with the houses of all her friends - it was non-stop visiting. She also brought us on her weekly shopping - I have fond memories of Jim Browne's shop in Carnew with everything seemingly being wrapped up in brown paper and string. She bought us to Mrs Doyles after Sunday Mass - we loved this 'cos we always got to play with their toys which always seemed to be better than ours. Dad was great for bringing us all on picnics. We played games like "I Spy" and guess the make of the next car we would meet on the road. And we sang Yellow Submarine in the car just like every other family in the 1960s. Innocent childhood memories. I was ignorant of what was going on in the 1960s. The Vietnam War was on, but all I remember about this was that every evening on the News a helicopter would be reported shot down. The Troubles in Northern Ireland were starting - but that was far away. Seán Lemass was Taoiseach for most of the 1960s, but I remember nothing about him. Towards the end of the decade I got to know The Beatles, but the (one) radio in our house was always tuned to RTÉ Radio and I remember praying that someone would play a Beatles song on the radio - but they hardly ever did.